Sprawling across Pluto’s icy landscape is an unusual geological feature that resembles a giant spider. As shown in the enhanced color image below – obtained by NASA’s New Horizons spacecraft on July 14, 2015 – this feature consists of at least six extensional fractures (indicated by white arrows in this annotated version) converging to a point near the center. The longest fractures are aligned roughly north-south, and the longest of all, the informally named Sleipnir Fossa, is more than 360 miles (580 kilometers) long. The fracture aligned east-west is shorter and reaches less than 60 miles (100 kilometers) long. To the north and west, the fractures extend across the mottled, rolling plains of the high northern latitudes, and to the south, they intercept and cut through the bladed terrain informally named Tartarus Dorsa. Curiously, the spider’s “legs” noticeably expose red deposits below Pluto’s surface. 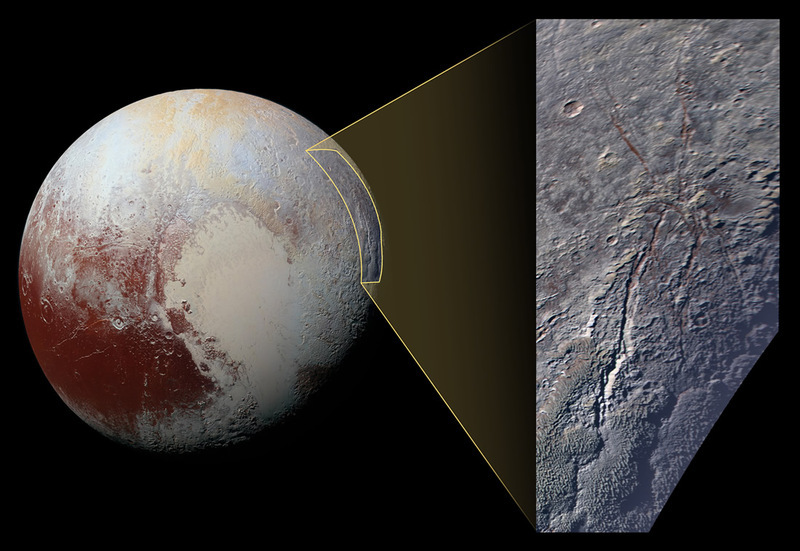 New Horizons scientists think fractures seen elsewhere on Pluto, which tend to be aligned parallel to each other in long belts – rather than intersecting with one another at a nexus, as this feature does – are caused by global-scale extension of Pluto’s water–ice crust. However, given the curious radiating pattern of the fractures forming the “spider,” it may instead be caused by a focused source of stress in the crust under the point where the fractures converge – for example, due to material welling up from under the surface. The spider somewhat resembles “radially fractured centers” on Venus called novae (http://photojournal.jpl.nasa.gov/catalog/PIA00150) seen by NASA’s Magellan spacecraft, as well as the Pantheon Fossae formation seen by NASA’s MESSENGER spacecraft on Mercury (http://photojournal.jpl.nasa.gov/catalog/PIA19410). This image was obtained by New Horizons’ Ralph/Multispectral Visible Imaging Camera (MVIC). The image resolution is approximately 2,230 feet (680 meters) per pixel. It was obtained at a range of approximately 21,100 miles (33,900 kilometers) from Pluto, about 45 minutes before New Horizons’ closest approach on July 14, 2015.